In the morning of the 17 January 1995 at 5.46 (local time) a strong earthquake shattered the Japanese city of Kobe and despite many constructions and buildings were assumed earthquake-proof, more than 6.000 people were killed and more than 300.000 people lost their homes. The earthquake generated along the intersection of the Nojima fault with the Suma fault, 16 kilometres below the Akashi strait, 20 kilometres to the west of the city. 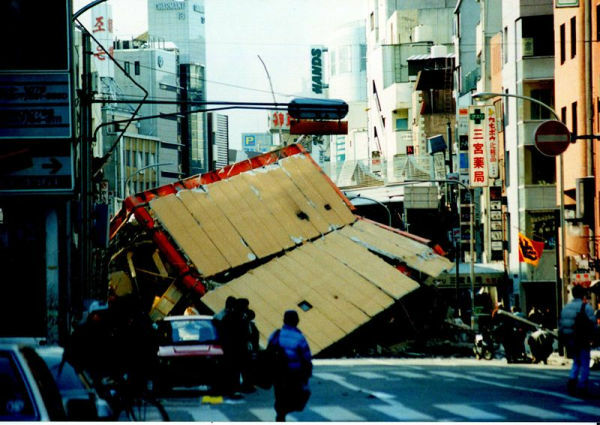 The main shake was preceded by a series of weak trembles, registered only by the seismometer in Osaka, then for 14 to 20 seconds earth trembled reaching a magnitude of 7.2 after Richter (7 according to the Japanese intensity scale - shindo, the strongest possible value), the strongest earthquake in West Japan since 1923. Fig.1. Fault model of Yoshida et al. (1996) for the 1995 Kobe earthquake. Two rectangles represent the surface projections of the fault segments and thick lines indicate their shallower sides. The solid star with a focal mechanism solution is the epicenter of the main shock determined by Katao et al. 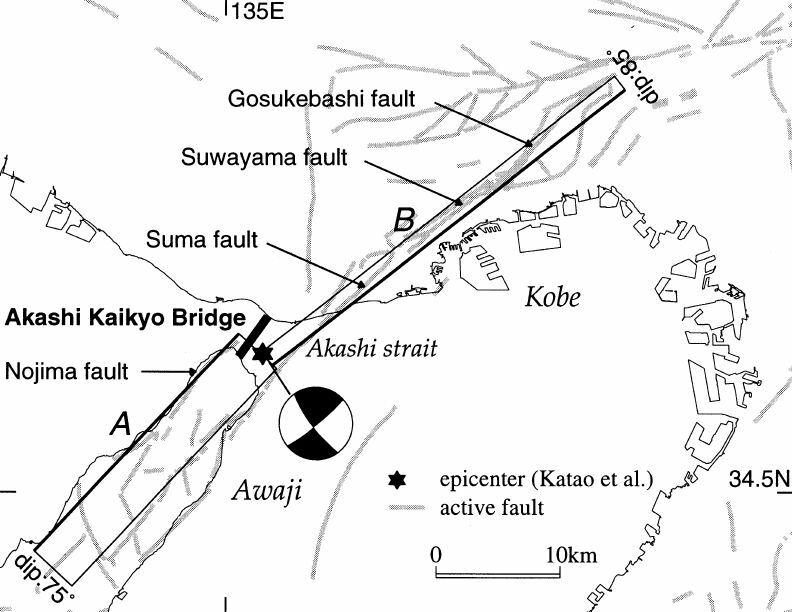 (1997), and gray lines are active fault traces, after KOKETSU et al. 1998. The earthquake damaged seriously the traditional buildings of the housing area in the west and east of the city; people were surprised asleep in their homes and killed or injured by the collapsing houses. The expressway of Hanshin, opened in 1962, was build according to the earthquake-resistant directives of the time; however it collapsed in 1995 for a length of 5 kilometres. Fig.2. Damage from the Great Kobe - also named Hanshin - Earthquake is kept intact at the Earthquake Memorial Park near the port of Kobe. The elevated Hanshin Expressway, in the background, was partially toppled by the earthquake, image from Wikipedia. 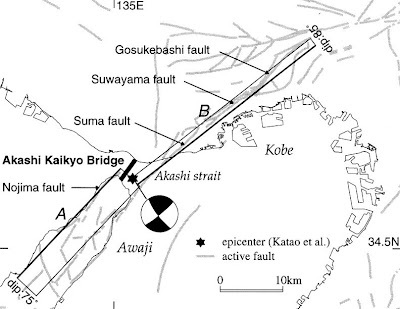 It was not expected that Kobe could be hit by such a strong earthquake, in fact the earthquake did generate from a local thrust faults-system, not directly connected to the subduction zone of the Philippine Sea Plate southwest of the island of Honshu. The harbour of Kobe, one of the most important in the world, was severely damaged and inundated by water coming from the underground, eyewitnesses-accounts report from fountains of water coming from fissures of the ground. The vibrations of the earthquake compacted the sand used to rise up artificially the harbour, and groundwater was pushed out of the vacancies of the sediment, the soil became liquefied and many fundaments of construction simply toppled in the water-sand mixture. Many survivors claimed later that help was poorly organised, in the following days food, water and cloths became scarce. People travelled on overcrowded streets to the nearby city of Osaka to organize these goods. The national government changed its disaster response policies in the wake of the earthquake and improved construction directives to account modern understanding of earthquakes and their occurrence. Great article. We should never forget this, but we can learn from it a lot, especially concerning vulnerability of large cities. Do you know the Kobe Earthquake museum where they show the causative fault and its offset? No! - thanks for the tip, I did know only of the non reconstructed part of the harbour and the photo.